Flight Data Monitoring and Analysis (FDMA) is used to enhance flight crew performance and air traffic control procedures. Thus, flaws in the aircraft operations can be detected before they lead to major accidents thus developing a preventive and corrective action. For this reason, they are integrated with the aircraft operator’s safety management system. In different regions of the world, the concept of FDMA is addressed differently. International Aviation Civil Organization (ICAO) has made FDMA mandatory for aircrafts above a specified maximum certificated take-off mass. This is expected to be the major driver for the Flight data monitoring and analysis market during the forecast period. According to the research report, the global flight data monitoring and analysis market is expected to be worth US$1,623.16 mn by the end of 2025 from US$677.6 mn in 2016. During the forecast years of 2017 and 2025, the global market for flight data monitoring and analysis market is estimated to progress at a CAGR of 10.4%. This report on the global Flight Data Monitoring and Analysis market provides analysis for the period 2015–2025, wherein 2016 is the base year and the period from 2017 to 2025 is the forecast period. Data for 2015 has been included as historical information. The report covers market dynamics including drivers, restraints, opportunities, and trends expected to influence the global Flight Data Monitoring and Analysis market growth during the said period. Technologies that are playing a major role in the driving the global Flight Data Monitoring and Analysis market have also been covered in the study. The study provides a comprehensive analysis on market growth throughout the above forecast period in terms of revenue estimates (in US$ Mn), across different geographies. The Flight Data Monitoring and Analysis market has been segmented on the basis of Aircraft Type and End-use Vertical. Based on Aircraft Type, the market has been further classified into Fixed Wing and Rotary Wing. By End-use Vertical, the market is classified into Civil and Military. The Civil segment is further segmented into the commercial and general aviation segment. Geographically, the report classifies the global Flight Data Monitoring and Analysis market into North America, Europe, Asia Pacific (APAC), Middle East & Africa (MEA), and South America; the regions are analyzed in terms of revenue generation. Furthermore, region wise prominent countries covered in the report include the following - the U.S, the U.K., China, Japan, GCC countries, and Brazil. The report also includes government policies and regulations supporting the Flight Data Monitoring and Analysis market. Porter Five Force analysis which identifies bargaining power of supplier, bargaining power of buyer, threat from new entrant, threat from substitute and threat from competition in Flight Data Monitoring and Analysis market is also included in the report. 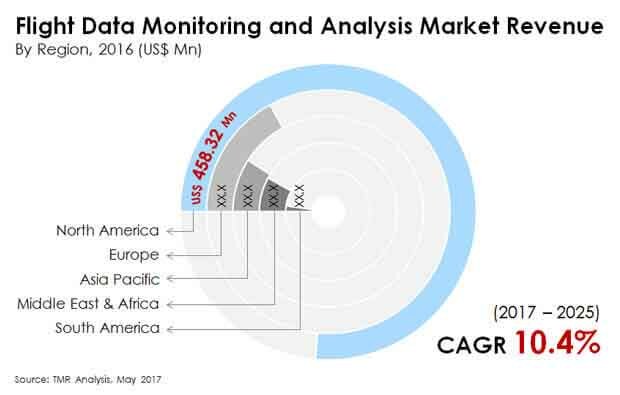 Ecosystem analysis which identifies key stake holders in the Flight Data Monitoring and Analysis market is also covered in the report. The report also covers segment wise comparison matrix, market attractiveness analysis and market share analysis for all regions covered in the scope of study. Competition matrix includes segment growth matrix, 2017 - 2025 (%), segment revenue contribution, 2017 - 2025 (%), and segment compounded growth matrix (CAGR %). Market attractiveness identifies and compares segments market attractiveness on the basis of CAGR and market share index for the forecast period. The report also includes competition landscape which include competition matrix, market share analysis of major players in the global Flight Data Monitoring and Analysis market based on their 2016 revenues and profiles of major players. Competition matrix benchmarks leading players on the basis of their capabilities and potential to grow. Factors including market position, offerings and R&D focus are attributed to company’s capabilities. Factors including top line growth, market share, segment growth, infrastructure facilities and future outlook are attributed to company’s potential to grow. This section also identifies and includes various recent developments carried out by the leading players. Company profiling includes company overview, major business strategies adopted, SWOT analysis and market revenues for year 2014 to 2016. The key players profiled in the global Flight Data Monitoring and Analysis market include Curtiss-Wright Corporation, Teledyne Controls LLC, and Safran Electronics & Defense. Other players included are Hi-Fly Marketing, NeST Aerospace Pvt. Ltd, Guardian Mobility Corporation, French Flight Safety, Helinalysis Ltd, FlightDataPeople, Flight Data Services Ltd, Scaled Analytics Inc., and Aerobytes Ltd.